To brew a classic hefe-weizen, you need the right yeast strain. 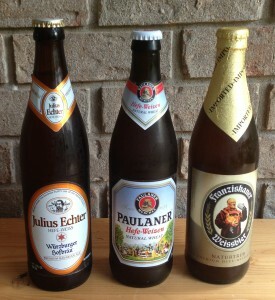 This is the fifth part in a series on German wheat beers. The first part was posted September 3rd. If you were to follow all of the instructions on making a classic German hefe-weizen, but fermented the beer with an English ale yeast strain, America ale yeast strain or lager strain, you would not yield a beer with the typical wheat beer flavor and aroma. Brewing a hefe-weizen requires a yeast that will produce the spicy, clove-like, phenolic aroma and flavor we all associate with wheat beers. This flavor comes from 4-vinyl guaiacol (4VG) and other similar phenolic molecules (including 4-vinyl phenol) and these are only produced in detectable quantities by certain yeast strains. These strains contain a variant of a gene (named POF, for phenolic off flavor) that is considered a flaw in most other beer yeast strains. Of course, to brew a hefe-weizen, you don’t need to know the genetics or biochemistry of what is going on— all you need to do is select an appropriate yeast strain. And, this isn’t hard since all the relevant yeast strains have either “hefe-weizen,” “weizen” or “wheat beer” in their names. The classic hefe-weizen strain, from the Weihenstephan brewery, is available to homebrewers as Wyeast 3068 Weihenstephan Weizen or White Labs WLP300 Hefeweizen Ale yeast. This strain will give you a balanced clove and banana flavor if your pitching rate, aeration and fermentation temperatures are correct. In a 5.0-gallon (19-L) batch, you will want to leave about 2.0 gallons (7.8 L) of headspace above the fermenting beer to allow for the kräusen. Fermenting in a 7.0-gallon (26-L) bucket will allow you to “skim the scum” and top crop the yeast if you wish. If you ferment in a carboy, a large blowoff tube is recommended. Beer produced by this yeast from a wheat beer wort will be hazy, as is typical for this beer style. Other wheat beer strains include Wyeast 3333 German Wheat, a good strain to use if you want to make a kristallweizen — a clear German wheat beer with the same clove and banana as a hefe-weizen. Wyeast 3638 Bavarian Wheat yeast produces esters reminiscent of pears, plums and apples, along with the usual banana ester (iso-amyl acetate). White Labs WLP380 Hefeweizen IV is a strain that produces less of the banana aroma, and more sulfur. White Labs WLP351 Bavarian Weizen yeast is another strain that produces a clasic wheat beer profile when handled correctly. Wheat beer yeasts used to only be available from liquid yeast manufacturers, but now there are also dried yeast strains available — Fermentis WB-06 Dry Wheat Beer Yeast and Danstar Munich German Wheat Beer Yeast (also packaged as Lallemand Munich German Wheat Beer Yeast). If you are a fan of hefe-weizens, it is well worth your while to try split batches of hefe-weizen and try out all of the strains that sound interesting to you. Keep in mind that these strains produce different results at different temperatures, and when fermenting worts made with or without a ferulic acid rest. Your favorite yeast at one fermentation temperature may not be your favorite at another. The next installment, on packaging wheat beers, will conclude the series. One more comment to add for Wyeast 3638 – it does produce some nice background notes of vanilla & sweet cinnamon. It has become my go-to hefe yeast (largely because it’s not 3068, which everyone else on the planet seems to gravitate towards), and it is especially nice in a dunkelweizen. I stopped by my LHBS and they were out of the traditional yeasts so I had to get WLP351. How would you advise manipulating the mash schedule/fermentation temperature to achieve results similar to WLP300? By description, WLP351 gives off less banana flavor. Would I just ferment higher to make up for it? I don’t think you really can manipulate one wheat yeast strain to mimic another. I would just brew the beer as normal and ferment with the WLP351 and see if you liked the results. The banana aroma in wheat beer is due to an ester (isoamyl acetate), and you could get more by fermenting at a slightly higher temperature. However, you run the risk of masking the clove-y 4VG character.